Note: Since doing these I did rebase them using the 1-2-3 system (more here). I found this way of basing more playable – especially in 6mm. There is no major secret that I am fond of the 6mm scale for doing my big 6mm GNW battles and this is where the 6mm scale is arguably at its best. 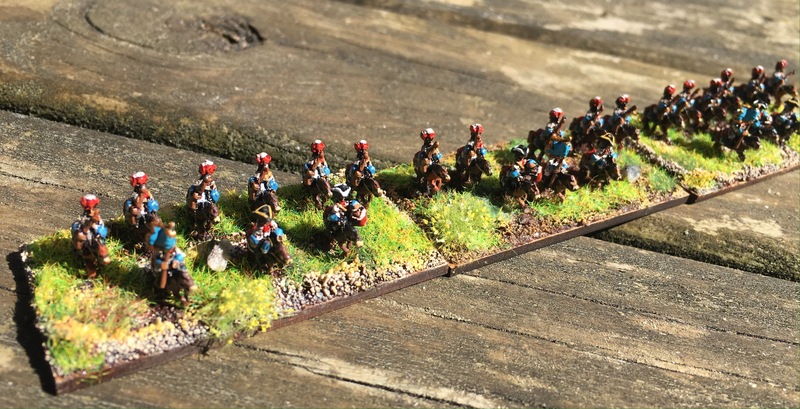 I did my “Saga in 6mm project” this year (you can start reading about it here if you are unaware of it) and took it to the Joy of Six in Sheffield to show that 6mm could be used for a game more commonly used with larger scales. The game worked really well and I replaced each miniatures with a 25mm square base of 4 to 10 miniatures. Following advice from the Welsh Wizard Mike Hobbs I did not change any of the rules and we just played them straight from the box. The ground scales are somewhat abstract in Saga and the only thing that in detail seemed a little bit wrong were Javelin distances. To date I have managed to paint one British and one French starting force, they are all based on a 9mm washer and are from Baccus Minatures (from their SYW or AWI range) with a small 3 by 0.5mm magnet put in the hole. 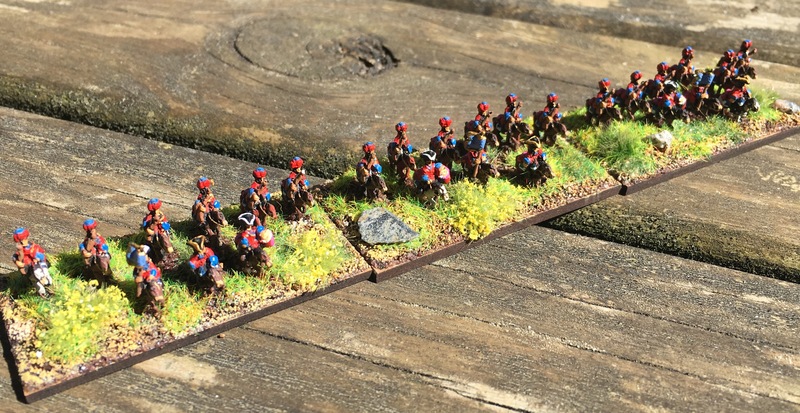 I painted each force in an evening sitting and to buy them from Baccus was at a cost of £13.20-16.50 per force (and giving enough additional miniatures to at least double each unit) – what is there not to like? I boosted the British Regulars to get some “point” balance against the French Raiding Party. I have included some pictures below. Next I will need to make the necessary markers and support list accessories, make some sabot bases, build some fences, buy some American style buidings and perhaps get some more troop options – I have already started a new shopping basket at Baccus. British Regulars two leaders, I used the Baccus SYW SBR01 – British Line Infantry Code. You get 96 miniatures in a pack (for £6.60) so I have plenty room to grow my force (I used 26). The NCO is from the command strip and the Senior officer with Sword on the right is a standard bearer with the pole cut off to represent a sword. Provincial Rangers, I used the Baccus AWI AWB06 – HIghlanders – Code. You get 48 miniatures in a pack (2 poses at £3.30) I used 14 miniatures . For the officers I was just going to use one of these and paint the “beret” blue but instead I used two miniatures from the AWL03 – Queen/American range pack from the AWI range. For the Newly formed militia I used AWR02 – Militia – skirmish from the Baccus AWO range. 48 miniatures for £3.30. I used 21 miniatures for this with the Leader being a conversion form the Indian pack (see the French below). Marine Infantry, I used SFR10 – Comagnies france de la marine – Formed from Baccus SYW range. 96 miniatures for£6.60! – you can build 4 units like this from one pack There is also skirmish pack at £3.30 that could be used instead. For my Indians I used AW02 – Woodland Indians – shirt. You get twice this amount out of a pack for £3.30. (For my next upgrade I will get some AW01 – Woodlands Indians Barechested and make some more warlike Indians with face paintings and use these guys for the British side). Yet another week in a sunny, and this time also rainy and windy, France. I thought I bang the drum for three of the places I visited with the family that may be of some interest. Nicely situated on a rock that once was surrounded by a lake and the river Le Payre. The Castle was originally built on the orders of William the Great, Duke of Aquitaine. William actually was not that Great and lost a lot of his lands to Vikings and other french nobles. I am not that convinced we will see him as a warlord in future Saga supplements! However from 1152, the Duchy of Aquitaine was held by the Plantagenets, who also ruled England as independent monarchs. Richard I Lionheart (or Richard Coeur de Lion as they call him in France) is the most famous of the rulers of Talmont and he did a lot of alterations to the castle. The castle have taken some damage over the years but is well worth a visit and depending on the day some activities to keep the family entertained including some periodic games and falconry. You can read more here. I have spent a lot of time in Normandy over the last few years going to the various WW2 sites (Pegasus bridge, the D-day beaches, Sainte-Mère-Église and seen the famous Church and visited the airborne museum to mention a few) and they are all amazing but there is a lot of older history that is also worth checking out. It seems like it is directly from a Warhammer Fantasy Roleplaying (WFRP) module. When I was standing on some of the viewing platforms on the top, with the wind blowing in whatever hair I have left, it did not take a lot of imaginary effort to feel like I was standing somewhere on the top of Minas Tirith in Middle-Earth viewing the hoards of orcs..sorry tourists approaching. This island have been used since the 8th century as a centre for religious worship, defensive position and even as a prison. Rich with history and to slowly walk along the small streets and passage ways up to the top and a visit the cathedral and the prison is a immersive experience that is not to be missed if you are in the region. There is a nice video showing off this amazing place here. This is a fantastic tank museum that, I personally, think is as good as the Bovington museum in the UK for us WW2 enthusiasts. It is even better if you are into cold war stuff I have been told by reliable sources. Here is a link to a video on YouTube showing a lot of the tanks and here is the official link to the museum itself. I bought myself some German Tank Paints by MIG and I tried out the dunkelgrau on some early German Zvezda tanks I found in a shop in Cherbourg. It seemed to work well. What about the Lesnaya stuff? As far as the Lesnaya project is concerned I had a little break from it last week. I did catch up with Nick Dorrell about it and we are good to go with the overall Towards Moscow Trilogy project I discussed in an earlier Blog. It is very likely that, after Lesnaya, we will do a what-if-scenario where the Swedish army attacks the Russian Position at Gorki 1708 instead of Holowczyn, but more on that later. Having started to paint the Finnish tanks for my Finnish Chain of Command project I got inspired to order some more stuff and when I came home a nice parcel was waiting with some Battlefront products including some finnish (Sissi) ski troops, a command group (to get an anti-tank rifle unit), and some Panzershreck and Panzerfaust teams (they were used by the finns but at the very end of the war). In addition some more vehicles including a BA-10 armoured car (from Zvezda), a BT-42 assault gun, a Vickers 6-ton tank and a Landsverk AA-tank. In that nice model shop in Cherbourg I also bought a T-60 and a KV-1 again from Zvezda. Yes the purist will say that the one T-60 known to have been captured by the Finns never was used in action – but I could not resist!